As far as EGT games go, 40 Super Hot slot is definitely one of the better ones. That’s not to say that 40 Super Hot online slot is for everyone. For instance, fans of the more complicated slots or the ones that aim to be on the cutting edge of current gameplay will probably not like this one at all. That being said, its bright fruit, sevens and star symbols definitely hit on our nostalgia bone – after all, we all need a little bit of tradition every now and then and this game certainly provides that. It’s a slot for those of you who want to go back to basics. There are 5 reels and 40 pay lines that complement the simple (some would say – basic…) graphics. Players can win up to 20,000 coins, which is an excellent jackpot, particularly for gamblers who are looking for a simple slot, with clear and concise gameplay. 40 Super Hot slot machine definitely proves that complexity isn’t always the answer when it comes to slots. You can play every single one of those 40 pay lines, so expect a few thrills and spills while playing on this game. Of course, with so many lines, you should also approach this slot with a little caution as it can quickly outpace your bankroll. However, if you really want to play all 40 lines, then simply click the blue button to determine the number of coins for your credit, then hit the autoplay and watch the wonderful chaos. It will automatically stop when you land on a winning combo, so don’t worry about missing any big wins. You will then get the chance to play for even more cash in the traditional, yet exciting, ‘pick a colour’ bonus round. This really is a throwback slot, which has kept many of the fun features of games of old. For instance, after every win you get the opportunity to guess the right colour card from a virtual deck – your choice is simple – red or black? This will double your winnings and you can just keep going as long as you like – or as long as you are brave enough. Of course, if you guess the wrong colour, you can lose it all. It’s a thrilling gamble, but one that should definitely be done with a little bit of caution. Sometimes it’s better to leave with a small profit and come back for more later! Overall, 40 Super Hot slot isn’t anything you haven’t seen before, but that doesn’t mean it’s not a fun slot that will keep you entertained for hours. What makes 40 Super Hot slot machine so special? 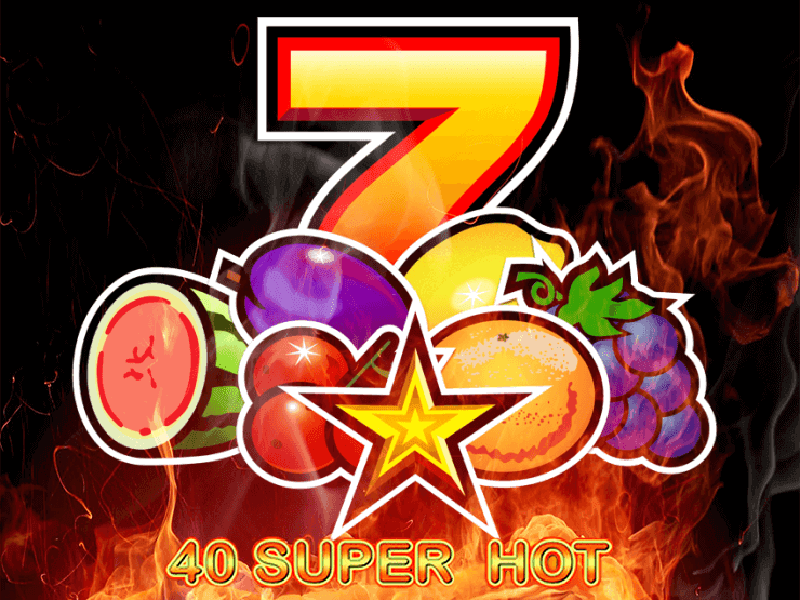 40 Super Hot slot machine is a game that can be hard to like at first but give it time and it just might grow on you. One of the major draw cards is its exceptionally generous top prize of 20,000 coins and its ability to appear that it is just about to pay out. The 40 Super Hot slot free play demo is also available for anyone interested to play the free 40 Super Hot slot game. Visually this slot just cannot compete with other recent releases and can feel like a bit like a Windows 95 game. But, it is cheerful, bright, and easy on the eye which allows it to produce a charm all of its own. The spins come quick and colourful and fans of fruit slots will be in heaven with this one. 40 Super Hot slot machine has a vibe that is all of its own. It’s not quite retro, though it has a touch of that to it, and it’s not quite modern either. It occupies a niche all of its own, which to be honest, players are either going to love or hate. We all like a well-crafted slot with a nice intro and cutting edge gameplay that weaves a complex and absorbing game. However, sometimes it’s good to be able to shut down, not have to think too deeply and enjoy some easy spins. This is where 40 Super Hot shines. There’s no middle ground with 40 Super Hot slot game and it is not trying to impress everyone. It is this confident self-awareness that is a big part of its charm. It’s not trying to be cutting edge, nor is it trying to be a throwback to the past. It offers up a solid fruit slot experience with a massive potential top prize. For gamers looking for a simple, straight forward slot without the gimmicks then they have certainly come to the right place with 40 Super Hot online slot.